2. Place bucket on 1st or 2nd step of pool. 3. Fill bucket with pool water to same level as pool. 4. Mark water level on inside of bucket. 5. Shut off pump and mark pool water level on outside of bucket. 6. Resume normal pump operation. 7. After 24 to 48 hours, compare the 2 water levels. ◦ If the pool water (outside mark) goes down more than inside water level, there is probably a leak. ◦ Test is invalid after 48 hours. Q: How do I determine how many gallons of water are in my pool? A: First, determine the average depth of your pool by taking the depth of the deepest end of your pool and adding the depth of the shallowest end (in feet). Divide this number by 2. This number is the average depth. Continue below based on the shape of your pool. A: Your pool filter is the most important component in keeping your swimming pool clean. Ideally, a filter should run all the time for maximum circulation and debris removal. A minimum of 8 hours a day in summer and 4 to 6 hours per day in the winter is highly recommended. A: To prevent chlorine evaporation, maximize water clarity and prevent algae your pool filter should run during the hottest part of the day. A: There are several reasons why this can be occurring. The pump motor bearings are failing and the motor needs to be rebuilt or replaced. There could be a partially blocked suction line causing pump noise in the way of cavitation. The pump could also be oversized for the application causing the pump noise and possibly overheat. Give us a call and we can diagnose the problem for you. A: This is dependent upon several factors. (the size of your pool, size of your pool filter, the type of pool filter you have, bather and contaminant loads most manufactures recommend a minimum of twice a year complete filter tear down and cleaning. Q: How do I know what size of filter does my pool need? A: There are many factors which go into determining the correct size of filter for you swimming pool, spa or water feature. You must first determine the required turnover rate and pool volume in gallons. Using this information, we can determine the ‘flow rate’ using the following formula: Flow Rate = Pool Volume / Turnover Rate / 60min/hour after determining your Flow Rate we can use the following equation to determine Filter Area (Filter Size) Filter Area = Flow Rate / Filter Media Rate. Here’s an example. You have determined that the total pool volume is 25,000 gallons and your required turnover rate is 4 hours. We must determine Flow Rate as follows; 25,000 gallons/ 4 hours / 60mins/hour = 104 gpm. We will now assume that you are planning to install a DE filter and we will use 2.0 gpm/ft^2 as the Filter Media Rate. Filter Area = 104 gpm / 2gpm/ft^2= 52 ft^2. Therefore, you would need to install a 60sqft filter (round 52sqft up to next filter size) to properly circulate and filter the pool water. It’s always better to oversize versus undersize the pool filter when in doubt. Q. How do I select a filter, and what are the pros and cons? A. – There are several types of filters and each is outlined below with a short description. For more information on what might be right for your application please give us a call. Bacteria and algae particle size are measured in microns. The smaller the micron the finer it is to detect with the human eye. Q. My pool pump electric bill is high. Do you install variable speed pumps to save electricity? A. – Yes we do. Most variable speed pool pumps can pay for themselves in about 1 year with reduced electric consumption. Standard pool pumps can consume as much energy as all other home appliances combined-often costing more than $1,000 per year! IntelliFlo® and IntelliPro® Variable Speed pumps can typically cut energy use up to 90%, generally saving up to $1,500 in utility costs annually-more where rates are higher than average. Q. Are there any rebates to upgrade my pool pump motor? A. – Yes, for certain qualifying pumps only. Gulf Power customers are occasionally offered a rebate when you purchase a qualified variable-speed pool pump. A: Cyanuric acid, also referred to as “conditioner” or “stabilizer” is added to swimming pools and spas to slow down the decomposition of chlorine from the sun’s ultraviolet rays (UV). With the correct cyanuric acid levels, it can save up to 80% of normal chlorine consumption during peak sunny months. The level should not exceed 100 PPM. Ideal range is 50-80 PPM. A:Pools should be disinfected continuously by a chemical which imparts a residual effect. Chlorine is a type of “disinfectant”, also called a “sanitizer”. Disinfectants or sanitizers destroy living microorganisms and bacteria, preventing the transmission of disease. There are several types of disinfectants, such as chlorine, bromine, salt chlorination, ozone, and UV light. Pools need a disinfectant with a measurable residual. A: Yes we do. More and more of our customers are switching to salt chlorination. Q: Is a salt chlorinated system better then the traditional hand chlorinated system? A: Salt chlorinators do have many advantages over the traditional hand chlorinated system. The salt chlorinator sanitizes pool water by converting the salt in the water to a chlorine gas, sanitizing your water and then changing back to salt. Adding fresh water to the pool does cause the salt levels to drop therefore salt pools do require salt to be added, usually two to three times per year. Also, the salt in the water works as a natural water softener, creating a much more comfortable environment to swim in comparison to the harshness of a hand-chlorinated pool. And finally, safety. 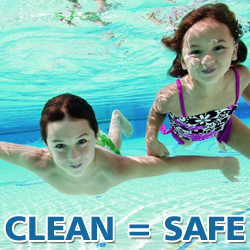 When it comes to pools, the most important thing is that your family is kept safe from bacteria and algae. Chlorine does not have a long life and therefore even if you test the water for chlorine prior to swimming and find the level is correct, after an hour or so that chlorine could have completely dissipated, leaving the water open for dangerous bacteria. Because a salt chlorinator will continue to sanitize your pool while the pool is in use, the chlorine in the water is constantly being replaced with “new chlorine”, keeping the water sanitized at all times and keeping your family safe. Salt cells do require manual periodic cleaning and maintenance. Also your swimming pool’s pH will tent to run very high and require large doses of muriatic acid. A:When your TDS (Total Dissolved Solids) are in excess of 2,000 PPM. Approximately every 3 to 5 years. A: The sum total of all the dissolved material in the water is called “total dissolved solids” or TDS. Sources of TDS in the water include disinfectants, balance chemicals, calcium hardness, source water, bather waste, algaecides, total alkalinity, wind blown dust and dirt, phosphates, nitrates, and sulfates. TDS buildup is inevitable. Every time you add chemicals to the water, the TDS increases. Even adding makeup water to the pool increases TDS. When water evaporates, only the pure water leaves the pool and all material that was dissolved in the water remains behind. This builds up over time, increasing the TDS. The ideal range of TDS is from 1000 to 2000 PPM, and the maximum level is 2500 PPM to 3000 PPM. There is no way to reduce TDS chemically. You must drain or partially drain the pool and replace with fresh water. Q: Should I change my own water? A: Only if you have a submersible pump and are familiar with adding start up chemicals (Cyanuric Acid, Stain Out, Chlorine, Acid). Draining a pool using the pool filtering pump usually will not work once the water level drops below the skimmer and is a lot of strain on your filter grids. A: Phosphate is the major cause of algae in swimming pools. Phosphate and nutrients are required by all living organisms, including algae to survive and flourish. Phosphate is introduced to pool water from a variety of sources including rain, runoff from lawns and gardens, fertilizers, bird seed, plant material, pool fill water such as bores, dust, suntan oil and leaves. With time all of these sources will cause a build up and increase the concentration of phosphate in the water and progressive algae growth. There are lanthanum based compounds /phosphate removers available to reduce the level of phosphate in your swimming pool water below 100ppm or as close to a zero reading as possible. Q: My hair turns green when I swim, is this caused by the chlorine? A: No. Exposure to metals dissolved in the water, particularly copper, iron, and manganese causes your hair to turn green. When metals attach to the hair shaft and are oxidized by the chlorine, they can leave behind a green residue. To remove the metals from your hair use a swimmer’s shampoo which contains the chelating chemical ethylenediamine tetra-acetic acid (EDTA). A: Dogs love to swim in the swimming pools. However, chlorinated water is not good for dogs. The chlorine can remove the natural oils from the dog’s body and cause dry, itchy skin. Also, too high of a sanitizer level can irritate the dog’s esophagus if they drink the pool water. Q: How do I keep ducks out of my pool? A: Ducks will avoid your pool if the majority of the water is somehow obscured or if the pool seems to be in use. Fill up as much of the open water surface as possible when the pool is not in use. Throw two large multicolored beach balls in the pool. Add two or more large alligator floats. A few safety pool ropes stretched tightly across the pool will also give the illusion the water is full, and the ducks will find another place to stay. Q: Is it safe to swim with my pool/ spa light on? A: We do not recommend swimming with your pool lights on unless you have a GFI (GFCI- Ground Fault Circuit Interrupter) and check it monthly by pressing the “test” then reset button. If the button does not depress when pushing “test” then “reset” your GFI might be bad and is not safe to swim. Q: There’s water in my pool light fixture, can it be drained and resealed? A: NO. Absolutely not. Water and electricity do not mix. This is one area Flagala Pool Service will not make exceptions because it could cause serious shock or death. Once water seeps in a fixture whether from the light seal, fixture or cord you must replace the fixture with an entirely new pool light fixture. Our liability and your safety and life are not worth a few hundred dollars. Q: My pool and spa lights both stopped working at the same time, how can that be? A: Most likely your GFI has tripped. Simply push the “test” then “reset” button then try your lights again. Q: My GFI keeps tripping on my pool lights, what is causing this? A: A direct short. If your GFI is constantly tripping or will not stay reset it is likely that one of your fixtures is shorted out and/ or has water in it. In this situation it is not safe to swim with the pool lights on. A: CONVENIENCE: Many simply can not afford the time it takes to maintain a pool on a regular schedule. We do the work and take the time to inspect the pool and the equipment for proper operation. If small parts are needed, they are obtained and installed on the next service date, saving you an inconvenient trip to the pool store. No need to lug home gallons of acid and chlorine and find a place to store them safely when not in use. COMPETENCE: We are experts, because we maintain pools for a living. Knowing what it takes to obtain the proper water chemistry is what we do daily. We know what to do if we spot an algae bloom. As with most things, consistency is critically important and that is why we come on the same day every week. We notice changes in the water balance and adjust accordingly. COST EFFECTIVE: It will cost you a little more for us to maintain your pool, but probably not that much. You will probably spend an average of $30.00 to $40.00 per month for the necessary chemicals, including chlorine tablets, muriatic acid, shock treatments and chemical test kits. For only a few dollars a week more, we will come to your house and do it all for you. WHAT IS YOUR TIME WORTH? : Lets do the math, If you spend an estimated 1 hour per week x 4 weeks per month cleaning your own pool and lets say you earn $20 per hour at your job $20 x4= $80 plus you are spending $30 to $40 per month on chemicals (and time to pick up chemicals). It’s costing you $120 per month at best to clean your own pool. 1.It is an insurance liability for us to add water. 2. When water is being added it makes it difficult to see the bottom of the pool while we are vacuuming. 3. Time. Our pool technicians are at your home for only 30 minutes. In 30 minutes at 7 gpm (gallons per minute) we would only be able add about an inch of water or 210 gallons, not a significant difference. Q: How do I add water to my spa/pool? A: Most new pools have an auto-fill float valve. For everyone else you should have a manual fill falve or by using a garden hose from home hose bib. A: No you do not need one. But we do recommend it! An automatic vacuum can assist in keeping you pool cleaned in between visits. After all, out of 10,080 minutes in a week we are only at your home for 30 of those. A: Yes! We highly recommend assisting us in emptying your skimmer and pump baskets especially during the fall/ windy season. If your baskets are overflowing the leaves will impair the water circulation and your pump will run dry. A: NO! A pool should not be drained for more than a couple of days. Without water your plaster will crack and in very rare instances where water tables are high pools have actually risen or popped out of the ground. Q: When it rains will the water cause my pool to flood the yard? A: No more than if you have only grass or cement in your back yard. Most backyards are equipped with a drainage system so there is nothing to worry about. Once the pool water level crests it is the same as having a cement yard. If you are still concerned you can backwash your filter for a few minutes to get the desired water level. Be sure to add fresh D.E. as soon as you are done or the filter will need to be cleaned again. Q: How long does it take to heat my pool? A: This would depend to a great degree (pardon the pun) on the size of the pool and the BTU rating of the heater. However, I have an 18′ X 36′ pool (about 25,000 Imperial gallons) and my gas heater raises the temperature at a rate of about 1/2 degree per hour. Q: How long does it take to heat my spa with a gas heater? A: An average sized spa 580 gallons with a gas pool heater should take approximately 45 minutes to get from 55* to 104* If it is taking substantially longer your heater is too small or it needs service. Q: How long does it take to heat my spa with an electric heater? A: If you have an electric heater then you have a portable spa/ hot tub and it must be covered when heating it. If you do not have a cover, get one right away. Portable spas are made to be heated and stay heated. Electric heat elements heat water very slowly at approximately 4 to 5 degrees per hour. It takes approximately 6 to 8 hours typically to get to 104* which is why it must stay covered to retain the heat. Q: Why are your rates higher then my old “pool guy”? Q: How will I know when my pool is serviced each week? A: Flagala Pool Service is one of the few companies who leaves a signed door tag on the front door if we don’t speak to someone each visit. Q: I have dogs. Can you still service my pool? A: Yes. As long as your dogs are not trained aggressive K-9 attack dogs we have no problem with dogs and other pets. Many of our pool service customers have dogs and we always ensure the gates are latched coming and going. Q: How do I obtain an estimate for weekly pool cleaning service? Q: How do I obtain an estimate for pool equipment repair? A: No problem. Most of our customers work and are not able to meet a technician during business hours. As long as there is open access we can come anytime during the day and call or email you with a quote. Give us a call to schedule an appointment. Be sure to let our staff know we can come “anytime” on the specific day your appointment is set for. Or simply fill out our online schedule request form and be sure to mention we can come “anytime” during the day along with the best method and times to contact you with your estimate. Q: When is my pool service bill due? Q: If I make an appointment for a free estimate and forget to cancel the estimate before the serviceman arrives will I be charged? Q: What happens if we cannot pay our bill? A: Call us! We do our best to work with all of our customers through financial difficulty. If you have an outstanding balance it is important you communicate with our office. We make every attempt to contact outstanding balances before collection efforts are enforced. Most accounts will be sent to collections and appear on your credit profile, a lien filed against your house, a lawsuit is filed in small claims. It is important to communicate to prevent any of the aforementioned means of collection, there are additional costs associated with collections that will be added to all outstanding balances.